Having a bit of a wincy time this afternoon looking through a book of poetry from my first year of college. You should never do that. The poems are uniformly horrible. Seriously, embarrassingly horrible. They will never see the light of day, but I don’t have the heart to throw out the collection. Recurring themes include nature and the environment (a regular John Denver, I was), music (huge for me in the 60s and 70s), family and friends. At least the themes were okay. I used my own pictures throughout as illustrations and prompts, and those, for the most part, were okay, too. Anyway, I decided to scan some of the friend photos.. and post them here. 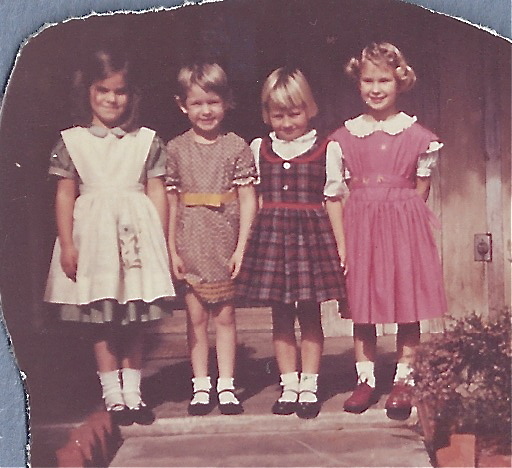 Standing on our front porch, here are Penny Lambert, me, Betsy Osborne and Janet Stark. Penny is long gone, no idea where she settled, Janet is a violin maker up in Oregon, but I’m not in touch with her. Betsy, a friend from the crib, is still a good friend. She had dinner with Mom and me just six days ago. She is the head nurse in the emergency department of Torrance Memorial Hospital and has been a nurse for something like 30 years. She’s amazing and someone I’ll stay close to for the duration. Here’s a photo of some of my first grade buddies on the playground of Valmonte School. I took this with my very own Brownie. Wendy Cooper, Sarah Beukema, mystery boy with hand on heart, Bruce Jewett, Missy Neal, Jeanie Larson, Loreta somebody, Donna Bennet, Lori Schrader, Caroll Spike (on tippy toes in back), Patty Keifer and Heather Lewis. Wendy visited a couple years ago, and is a regular facebook buddy. 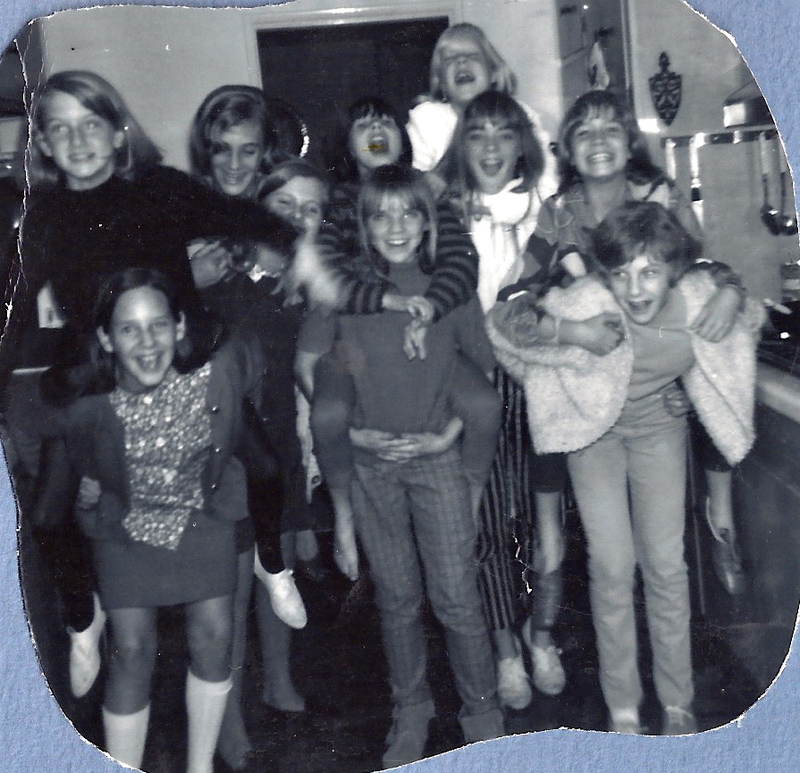 Me on top of Julie Broen, Sally Alden on top of Patti Harrer, Lisa Sterman on top of Jeanie Larson, Robin Lee on top of Katy Schriener and Donna Bennet on top of Wendy Cooper. I think we are in Lisa’s kitchen, there for a girl scout meeting. Troop 262. Junior High, probably about 6th grade. All but Patti and Wendy lived in our neighborhood… it was just packed with kids. I see Julie a fair amount on facebook, Robin, Lisa and Donna a bit, and Sally and I just did a road trip from Georgia to California last fall. And finally, here’s one of my two closest neighbors and best friends, Julie Broen (two doors down) and Katy Schriener (next door). 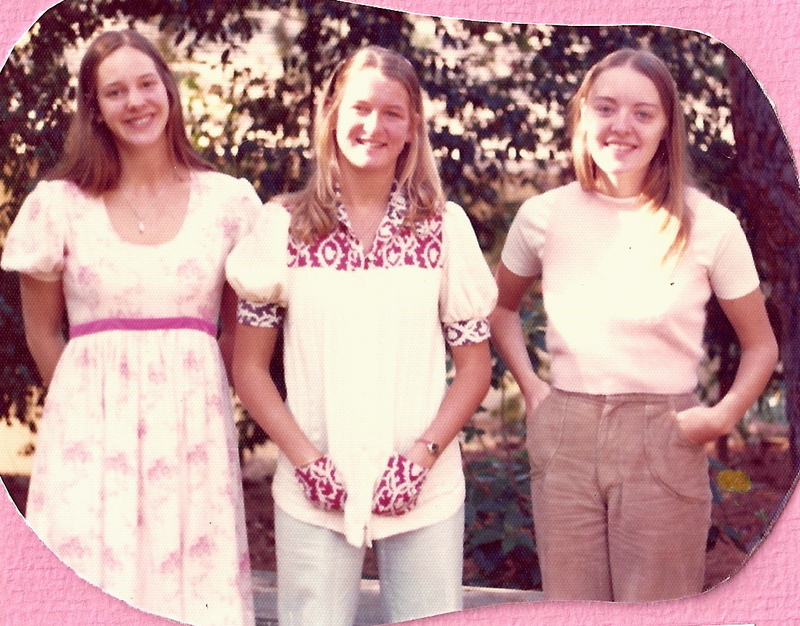 This was taken, I think, circa our first year of college… we’d gone away and come back for some holiday. Standing in front of the giant jeffry pine in Julie’s front yard (a tree we spent a lot of time in). Julie is married to a minister, does some ministry of her own in the same church, I believe, and lives up in Oregon. Our dear friend Katy has passed away. The friendships live on, some only in my heart, but they live on.